No. 22, Jalan TP 3/1, Taman Perindustrian SIME UEP, 47620 Subang Jaya, Selangor, Malaysia. 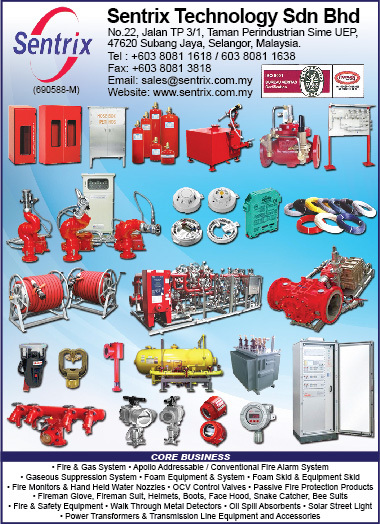 Sentrix Technology Sdn Bhd is Malaysia’s leading independent designer and installer of fixed fire protection and detection system. Our manufacturing facility is ISO9001: 2008 Certified by Bureau Veritas. We specialize in the full turnkey package from initial design concept through to end-user training and servicing which in compliance to the requirements of ISO 9001:2008 Standard. Sentrix Technology applies our knowledge and experience to provide clients with quality equipment and products to meet project requirements for all aspects of fire protection during design and construction of plant and building. We firmly believe that our solution make significant positive contributions to the prevention of accidents and disasters as well as eradicating fire threats. We are determined to continue to provide solution to uphold public safety and security. This motivation culminates in a full range of fire protection products which have the full backing of our principals. 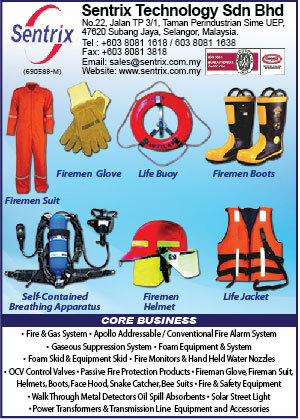 Sentrix Technology has already embarked on its journey to be a world-class entity offering Fire Protection solutions that will benefit mankind. The company is located in USJ Subang Jaya in Selangor and is near Putrajaya, KLIA, Sunway and Petaling Jaya. Using Malaysia as its base, the company aims at the global market to offer a range of products and services. Sentrix Technology has since built a strong managerial and engineering team and is set to achieve its intended goals. Sentrix Technology has a wealth of experience in protecting all sizes and complexities of plants, premises, providing designs, supply, installations and maintenance of systems and equipments, both locally and internationally. Our clients are from practically every field – Petroleum Refineries, Onshore and Offshore Platforms, Petro Chemical Plants, Defence Establishments, Airport Authority, Ports, Malaysia Fire & Rescue Department, Commercial and Industrial Premises, Government Establishments, Banks etc. The company has a firm belief in developing long-term relationships based on mutual trust and understanding. This partnership approach means that every effort is made to fulfill expectations on time and budgets with the minimum of inconvenience. Sentrix Technology’s commitment to quality is total and applies to all areas of business; ensuring clients receive the highest standards of service and aftercare 24 hours a day, 365 days a year. We take pride in our expertise to deliver solutions that are helpful, effective and reliable to customer’s requirements. Our strength and the reason for our continued success are due to our responsive service at the very highest standard.